To the best of our knowledge, our "Rayon Bamboo" products are made from 100% Bamboo (or for socks, 94% Bamboo rayon and 6% Spandex). There is a debate raging about how or if bamboo rayon is really "anti-bacterial", "sustainable", or "earth friendly", and if it is better or worse than other fibers for you and the planet. We don't know! We just sell socks! We're like, sock guys, not scientists. The only claim we make is that your feet will be warmer with socks. Also, if you dye and decorate them, your feet will look better! There is a lot of information available on this topic on the internet. Check it out if it interests you. Rumor has it that bamboo rayon fibers are both highly absorbent and possibly bacteria resistant. What better qualities are there for a sock, we ask. Still cellulose, so they dye beautifully with our Fiber Reactive Dyes. We weren't originally serious about them because we thought they would be too expensive but we were able to get a really good price on these as they are basic summer weight socks. Nothing fancy in design, mind you, but that's your job! They are 94% pure Bamboo rayon that has been developed in the same way other Rayon fiber is, but made from bamboo, and 6% Spandex for stretch. Looking for something a little different? Check out our Bamboo Footie Socks. 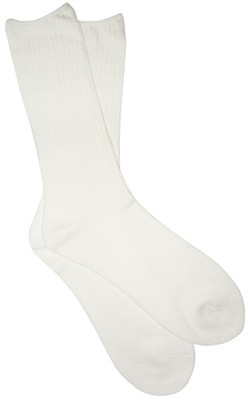 Bamboo socks come in packs of 3 pair. Prices are per pack of 3 pair. Each pack counts as 1 item for discounts. There are so many great things to say about these socks.1. I cannot keep them in stock.2. Ecologicaly sound.3. Takes dye extremely well.4. Very soft.5. Wears like iron.6. Seems to be less likely to slip on smooth floors than cotton or acrylics.7. Lycra well hidden much better than in most cotton socks very important in dyeing.8. Well I COULD go on and on.9. ORDER EXTRA!!!! !ORDER MORE THAN YOU NEED THEY DO GET BACK ORDERED OFTEN!! These socks dye well - no visible nylon! - and they are comfortably sized not too tight on normal-width feet. These are very soft and comfortable! I dyed mine with procion dyes and they are just beautiful. Everyone loves the unusual colors so I am buying more for gifts. LOVED these!!! Dyed beautifully. I'll definitly be ordering more! These are AWESOME. I can't wait to order more. I ordered the larger size (all that was in stock) and they are a little to big for me (women's size 9) but still workable. I wear these socks Fall through Spring around the house. They are comfortable and are loose enough so they do not to leave lines on my skin. I am not diabetic but feel that there is no need to constrict my ankles. They keep my feet warm overnight in winter too. i love these bamboo sox. When my best friend asked me what I wanted for my birthday (in 6 days!) I told her I wantedneeded more bamboo sox and she really heard my excitement about them and ordered some for herself as well. I love these socks! They are amazingly soft. Somehow over time all my cotton socks have disappeared and been replaced with bamboo! I have been dyeing a few pair of these socks at our annual tie dye party every year for the last several. I wear a woman's size 9 shoe (men's size 7) and the smaller adult size fits me well. They offer a lot of stretch but they don't lose their shape.We use Rit dyes to keep things simple at a large party and the socks take dyes better than our cotton and don't seem to fade over time like Rit does with cotton pieces. The lycra threads do not show through at all.The socks do generate quite a bit of lint and I need to turn them inside out occasionally to remove the clumps of lint. Mine have worn through at the heel after a year or two but my children's are still in great shape. Even with the bamboo worn away the lycra holds so I still wear them like this.These socks are so soft and buttery! They feel wonderful on my feet though some who are sensory sensitive may find them rather "oily" feeling. These have become the favorite socks in our house! Bought 12 sets of the socks (love that you get 3 per set) for a high school art club project. We made socks for all of the teachers at our school. The socks are SO SOFT. We have received so many compliments on them. They were easy to dye and took the color well. I have dyed socks before where the dye doesn't take on certain parts of the sock because of elastic or whatever- the dye takes completely on the entire sock. They all look amazing!!! It was the least expensive we could find online- great service we received them fast. they do tend to run out- probably because these socks are amazing. Thanks Darma!!!! Wonderful sock for winter but be aware that bamboo stretches differently from cotton. I wear size 7 shoe but in the bamboo socks I wear a children's size 7. The regular adult size will fit most men. These socks blew my expectations out of the water. When dyed they're the silkiest softest things you could put on your feet. I can't stop wiggling my toes! They're lightweight and tall and they take dye better than cotton. Order with confidence you won't be sorry! !